From the tip of Cornwall to Hadrian's Wall, we’ve found thousands of campsites, glamping sites and holiday parks in England. Here at Cool Camping, however, we prefer quality over quantity and, if you’re planning on camping in England, you’ve come to the right place. Whether you’re looking for traditional camping in the English countryside or luxurious glamping along the coast, our curated collection showcases only the very best campsites in the country. 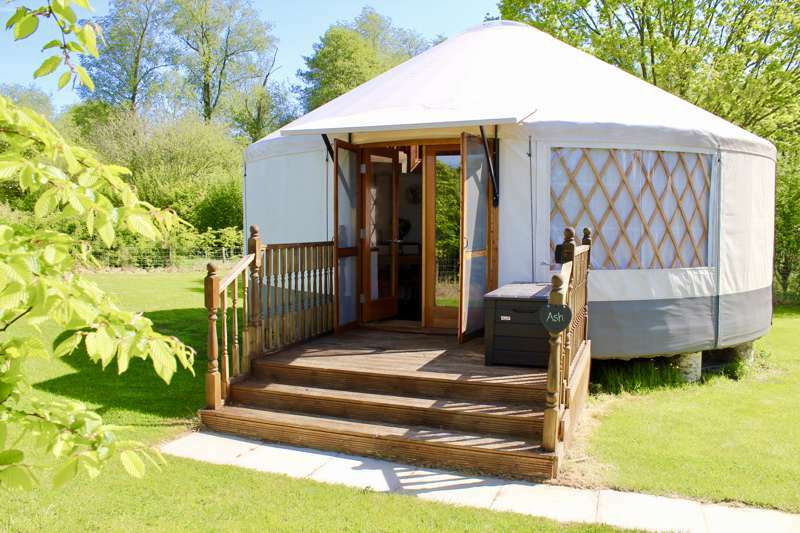 Luxury private yurt glamping on an organic farm in the Kent Downs. These super-sized, double-decker yurts on a charming East Sussex farm take glamping to another level. Romantic en-suite shepherds huts on a riverside farm in the Peak District National Park. Err, hello! 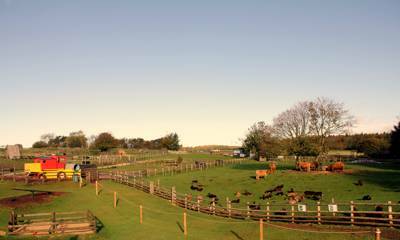 Camping with children next to the most popular farm park in the country, with an adventure playground, bouncy 'pillows' and baby animals to cuddle and feed – for families, what's not to like? What with a camel farm on its doorstep, Cornish Yurts could be in a foreign land. Luxury yurt camping on the magical Lizard Peninsula. A campfire for lingering summer evenings and a log-burner for chillier nights. What with a camel farm on its doorstep, Cornish Yurts could be in a foreign land.Luxury yurt camping on the magical Lizard Peninsula. A campfire for lingering summer evenings and a log-burner for chillier nights. A car-free riverside campsite at the foot of a small valley. Yorkshire’s original glamping site and one of the first in the UK. You feel like you’ve reached the end of the world once you get here – which is fine, as there’s so much to do. Sea views and a good location to explore Dorset. Lovely big camping areas amidst the heathland and lots of onsite fun. As close to wild camping as you can get in the heart of the New Forest. Riverside camping near the homely village of Martham, with campfires permitted, easy canoe launching and excellent local fishing. A wonderfully tranquil camping experience, with the Broads National Park as your back garden. Brooks Country House Pengethley Park, Nr Ross-on-Wye, Herefordshire, HR9 6LL. Brooks Vintage Horsebox Glamping, Brooks Country House Pengethley Park, Nr Ross-on-Wye, Herefordshire, HR9 6LL. Luxury, family-friendly safari tent glamping on the edge of elegant Woodhall Spa, complete with your own private hot tub. 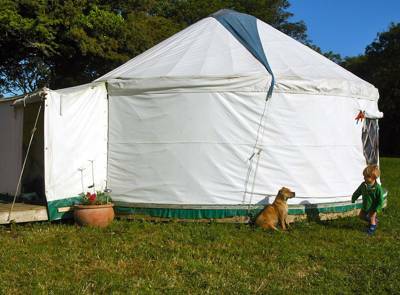 Lovely eco-friendly yurt site with plenty of room to roam and excellent facilities, set on a dairy farm in Quantock country. Super easy to reach, too. Mongolian warmth with a twist of French style in this spectacular Herefordshire country garden. Family glamping in Devon's Culm Valley that offers an inspiring and safe space for children to play. Get a dose of The Good Life in The Garden of England. Small-time camping with a family-friendly buzz and a warm back-to-basics atmosphere. Rural comfort right on the Pennine Way’s doorstep. Quiet farm retreat. Rural glamping on the farm with the perfect combination of luxury and real hands-on outdoor fun. Unbeatable views and wildlife on the only farmer owned and managed National Nature Reserve in the UK. Charming ingenuity in this unique glamping abode that boasts a private veranda and wood-fired hot tub. Hi-spec shepherd's huts in the grounds of an historic Northumberland manor house. Steeped in history, Holmsley occupies what used to be Holmsley Airfield, one of 12 wartime advanced landing grounds that scatter the magical New Forest. Shepherd's huts, tipis, bell tents and more offer both a convenient escape from London and a pleasant rural location in the Garden of England. One of 'Camping in the Forest’s' ten New Forest locations, Longbeech comes steeped in wartime history and brimming with rare flora and fauna. This really is forest camping at its finest, and is the ideal spot for campers wishing to let loose on a bike or fancy getting lost on one of the New Forest's countless walking trails. With so much wilderness and water at your disposal, is there really an excuse for not spending a night or two at Ocknell? You can hire bat detectors from the wardens! Six acres of woodlands and only 500 meters from the seafront. Relaxed camping in the New Forest with a great pub right on the doorstep. 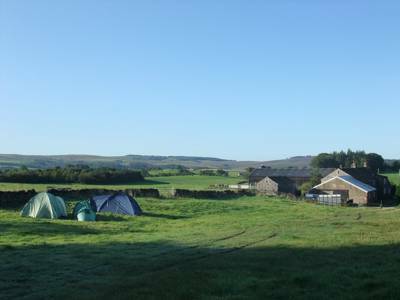 Wonderfully simple camping within easy reach of the Peak District. Back-to-basics camping by the River Thames, only accessible to campers by foot, bike or boat. 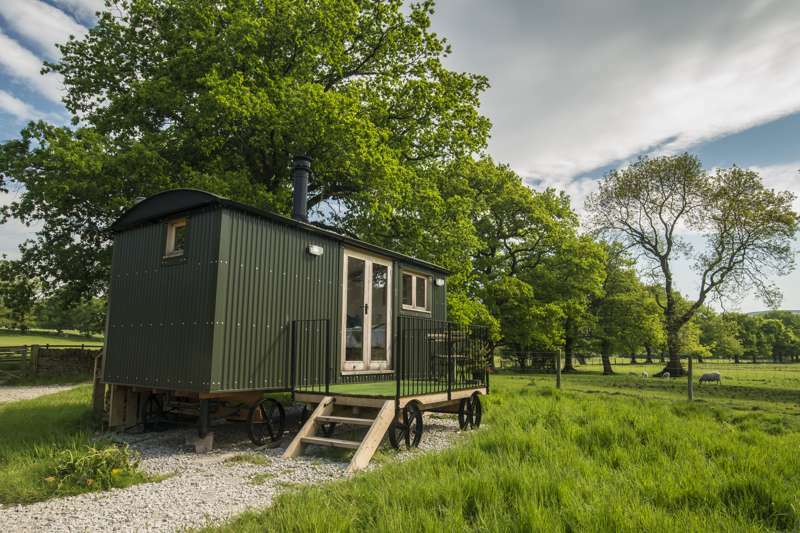 An eco-friendly glampsite high in the hills of the Lake District, amid the trees of a traditional working farm. Eco-luxury glamping with maximum comfort and minimal environmental impact. Luxuriate in your private wood-fired hot tub, the essential oil scented wood fuelled sauna or book a massage in the 'Shepherds Rest' treatment room. This site always has something new to reveal: a field hidden behind majestic oak and pine trees, a secret pathway, or a genteel village you never knew existed. Adult only glamping lodges, complete with a hot tubs and BBQs, that boast exquisite views of the Chilterns. An off-grid getaway where you can escape the gadgets and enjoy the outdoors in comfort. From the tip of Cornwall to Hadrian’s Wall, there are thousands of campsites in England. There are campsites in national parks, on farms and on England’s long and varied coastline. The Cool Camping team have pitched up at hundreds of camping and glamping sites across the country to find the best of them and bring you a curated collection of places that we think offer something special. Whether you’re looking for a place to pitch your tent in the Lake District, a family-friendly campsite by the beach, a romantic glamping stay deep in the New Forest or something in between, we’ll have something you’ll like the look of. Thinking about booking your annual camping trip? East Anglia should be on your hit list, it has campsites galore. You’ll fulfill all your camping needs in Norfolk and Suffolk in this carefully curated list. Glamping spots, dog-friendly campsites, family-friendly camping, caravan sites, a real assortment of camping choices. There are campsites aplenty in the East Midlands. Fancy a romantic glamping break, we’ve got a site for you. After a scenic family-friendly mountain view campsite? No worries. Read on for our full selection of campsites. If the North East of England is calling you for a camping holiday, look no further than Cool Camping’s handpicked list of the best campsites to stay in. There’s an array of sites, whether it be glamping, pitching your tent in a remote spot, or parking your campervan in a scenic campsite. Why not check out the North West of England for your next camping trip. All bases are covered, with farm camping, dog-friendly sites, campsites where you can light a campfire, spots where you can pitch your tent with a lovely view. You’re sure to find a campsite you like the look of. Whether it’s pitching your tent or parking your caravan, this expertly selected collection of campsites in South East England will be the perfect inspiration for your next camping adventure. Discover the South East’s best campsites now and book online instantly at the best price. 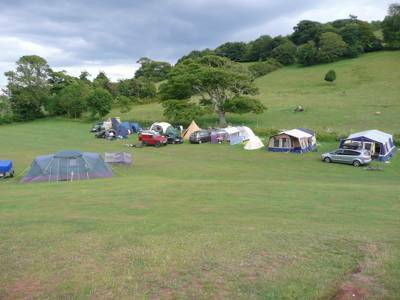 Need to find a campsite in the South West? Whether it’s Devon or Cornwall, camping or glamping, tents or campervans, you’ve come to the right place. Find the best campsites in the South West of England here with Cool Camping’s expert editor’s picks and book them all online now at the best price. Simple! From tiny riverside campsites to family-friendly camping getaways, discover the very best campsites in the Midlands with this curated collection, combing all of the very best campsites in the East Midlands and West Midlands. Going camping in the West Midlands? Read on to discover the best campsite for you. Here at Cool Camping we have a range of campsites to suit all tastes, from glamping spots to dog-friendly sites, scenic campsites to mountain view camping. Whether you're looking for beautiful beaches in the South West or planning to climb the mighty mountains of the North, England is a land awash with interesting things to do and places to go. On rainy days there are endless attractions to keep you busy – museums, activity centres and historic attractions – while, on sunny ones, the seaside, the hills and the countryside offer ample opportunity to enjoy the great outdoors. Along with visiting campsites all around the country, our Cool Camping travel experts have also taken time to pick out some of their favourite places to go in all of our latest blogs and articles. For detailed tourist information you can, of course, visit the official Visit England website where there is bags of helpful advice about where to go all year round. Whatever you choose to do, make sure you take the tent, book a place to stay and enjoy life under canvas along the way. Wild camping may be illegal in England, Wales and Ireland but, while we would never encourage law-breaking behaviour, we’ve got the lowdown on the loopholes and locations that you should look out for in your hunt for the perfect wild camping spot. From the oddly named shingle beach at Slapton Sands to hidden coves and secret bays that only appear when the tide is out, we pick our top 10 beaches in South Devon. The Isle of Wight and camping go hand in hand. But why do people love it so much? What's so special about the Isle of Wight that sets it apart from the rest of the UK? Walking through ancient woodland, wildflower meadows and barefoot on sandy beaches, visiting magnificent castles and old country pubs, tucking in to cream teas and ploughman’s lunches… it can only be England. A camping holiday in England gives you the chance to enjoy all the things that make its coast and countryside great. With ten national parks protecting some of its most special landscapes along with varied coastline and countryside, England offers a lot of fantastic places to go camping and glamping. And the best campsites are as varied as the places you’ll find them in. Some are special because of their location, others are special because of their facilities and some stand out for the opposite reasons; places in the middle of nowhere with nothing to do but relax. We’ve scoured the country to find the best campsites in every region from the Lake District to the New Forest and from the Norfolk Broads to the Cornish Coast. We’ve tried to cater for all tastes in the Cool Camping collection too and feature family-friendly campsites as well as adults-only ones; shady woodland campsites and sunny meadow spots; back-to-basics camping and all-out luxury glamping. In our opinion, there’s nothing like a few days of classic tent camping to help you relax and reconnect with the natural world. With your tent as your canvas bedroom, the great outdoors serves as your living room, play room and kitchen. Whether you’ve opted for a woodland, meadow or beachside site, you’ll have plenty of time to appreciate the scenery and soak up the atmosphere. You can be lulled to sleep by the sound of the surf at a seaside site and gently woken by birdsong in a country location. Glamping in England is an increasingly popular way to holiday and continues to go from strength-to-strength. It’s the perfect solution for people who want the fun of camping but without the hassle of pitching a tent. With Britain’s unpredictable weather, glamping can be a godsend if you’re a self-confessed fair-weather camper. Book yourself in to a pre-erected bell tent, yurt, safari tent or tipi and, should the heavens open, you won’t be left struggling to find tent poles in the rain. It’s even more of a blessing at the end of the holiday when packing up a soggy tent can, quite literally, be a bit of a dampener. Glamping also extends the camping season in England where spring, autumn and winter can be chilly. You don’t need to be a hardy camper to enjoy a spot of winter glamping if you book in to a cosy yurt, gypsy caravan or shepherd’s hut with a wood-burning stove. In fact, some might say that glamping is at its best in the winter months. The range of glamping accommodation in England is vast from modern geodesic domes to treehouses that look like they’ve come from the pages of a fairytale. There are horse boxes, buses, helicopters and more that have been converted in to places for glampers to getaway: the more eccentric, the better – this is England after all! The Lake District is one of the England’s most-visited regions and, among its many highlights, you’ll find the country’s highest mountain and its largest lake. It sure does get busy at weekends and during school holidays but, as it’s also England’s largest national park, you can usually take yourself off and find a quiet place to reflect upon its natural beauty. Camping among its peaks or on the shores of one if its lakes is a sure-fire way to make the most of the scenery. While many of the tourists are tucked up in town, campers and glampers have the chance of seeing the peaks at sunset, sunrise and silhouetted by the stars. But just sitting back and enjoying the views isn’t what the Lakes are all about: this is England’s outdoor capital. Hiking, climbing, mountain biking, kayaking and more adventurous activities are all on offer all day, every day in this region – and if you’re not taking part you’ll be the odd one out. Put in the effort to get to the top of one of the region’s mountains and you’ll be rewarded with views that are unrivalled in England. While the wilds are the main draw, that’s not to say that the Lake District’s town and villages aren’t worth a visit on days out from your campsite: Grasmere, Ambleside, Kendal and the rest all have their own appeal and there’s plenty to keep everyone occupied. There are tearooms, pubs and restaurants to fuel-up in and lots of attractions too. You can visit the former home of the poet William Wordsworth, Dove Cottage, in Grasmere, take a cruise on the lake from Windermere and visit the World of Beatrice Potter in Bowness-on-Windermere. Yorkshire and the North East of England offer fantastic camping country encompassing huge rural areas, three national parks and some fascinating places to visit on days out. England’s far North East is where you’ll find one of its best-known and most-recognisable landmarks, Hadrian’s Wall. With the remains of Roman forts and a walking trail running the length of the route, it’s a fascinating place to visit and it’s far from the only historic site in Northumberland. The county, on the border between Scotland and England, is home to more than 70 castle sites as well as the island of Lindisfarne with its famous Lindisfarne Priory. Northumberland is also known for its beautiful, long sandy beaches and the wildlife that thrives both on and off shore. If all this isn’t enough to make you want to go camping in Northumberland, how about the fact that it’s got some of the country’s best star-gazing? An area above the Northumberland National Park has been designated as an International Dark Sky Park and even offers the possibility of seeing the Aurora Borealis (Northern Lights). Further south, Yorkshire boasts not one but two national parks of its own: the Yorkshire Dales and the Yorkshire Moors. The Moors are an area of heather moorland with a beautiful coastline, while the Dales are inland at the heart of the country and, as the name suggests, are rural, rolling and green. Expect drystone walls and old barns, wildflower meadows, quaint villages and babbling brooks. If you’re thinking of the age-old TV favourite Last of the Summer Wine, you’re on the right track, though apparently that was filmed in the part of Yorkshire that stretches in to yet another national park, the Peak District! The Peak District was England’s first national park and the place where the “right to roam” was established. It remains the perfect place to do just that. It’s 500-square miles of heather moors, rolling dales and rocky outcrops in the middle of the country beg to be explored on foot. It’s also a magnet for climbers with gritstone peaks and outcrops, like the four-mile stretch at Stanage Edge, offering routes for all abilities. There are plenty of outdoor adventure companies offering days out with expert guidance and equipment hire. Stanage Edge falls in the northern part of the national park, an area known as Dark Peak for its peat bogs and dark gritstone. South of the beautiful Hope Valley the landscape changes: farmland, dry stone walls, rolling hills, rivers and woodland make up the White Peak. If you’ve got any energy left after walking, climbing, cycling and generally making the most of the endless trails across the Peak District there are plenty of other things to do on days out from your Peak District camping or glamping site. There are a number of fascinating caverns and caves open to the public and there are dozens of pretty villages and market towns within the national park – including Bakewell (home of the Bakewell pudding). If you like visiting historic houses and gardens, you won’t want to miss one of England’s grandest stately homes, Chatsworth House. The long sandy beaches of Norfolk make it a firm favourite for family camping. There are lots of great campsites on and near it’s coast and it’s easy to see why. There is something truly special about Norfolk. Its dune-backed beaches are great in sunny weather when you can roll up the trousers and go paddling in shallow waters, but they’re equally awesome when it’s wild too: windswept and atmospheric. With seal and bird colonies off its coast, it’s great for wildlife watching too. Nature lovers will also love Norfolk’s hinterland of marshes and fenland where quiet waterways drain the farmland that East Anglia is famous for. Of course, Norfolk’s most famous waterways are The Broads, which cross the county border in to Suffolk and are protected as a national park. The 125 miles of navigable waterways offer waterside walking, kayaking and canoeing. The Suffolk coast is no less special than Norfolk with big sandy beaches and wildlife hotspots like Minsmere RSPB as well as quirky seaside resorts like Aldeburgh and Southwold where you can take a stroll down the pier. Both Suffolk and Norfolk have their fair share of grand houses and quaint market towns but it’s in Suffolk where you’ll find perhaps the most picturesque medieval villages: the Suffolk wool towns with their half-timbered houses and lavish churches. Suffolk’s Dedham Vale and Stour Valley Area of Outstanding Natural Beauty is another great place to camp or to visit. Known as Constable Country as it was here that one of England’s best-loved painters found inspiration for some of his paintings, including his best known work, The Haywain. From the centre of the south coast to its eastern edge, Kent, Sussex and Hampshire share a landscape of chalk downs, farmland, ancient woodlands and coast. While the gently rolling hills and heath may lack the drama of wilder and more remote areas of England, there’s something oh-so English about this green and pleasant land. Kent touts itself as the Garden of England and with good reason. Outside of its urban areas and away from its coast, it’s all farmland and orchards with a few mighty castles and historic chocolate-box villages thrown in for good measure. Neighbouring Sussex offers more of the same. 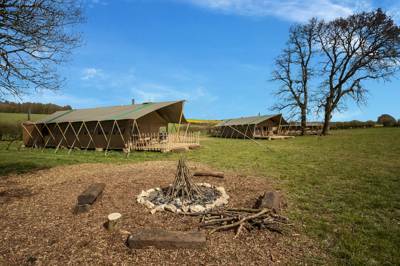 The county has dozens of great camping and glamping sites; from woodland sites where campfires are allowed to places that are just a stone’s throw from the beach or a few steps off the South Downs Way long distance walking path. The South Downs form England’s newest national park and cut a swathe across the county from the famous chalk cliffs at Beachy Head into neighbouring Hampshire, separating the beach resorts of the coast including buzzy Brighton, Hastings and Eastbourne from the country villages and estates further inland. At the other end of the South Downs is historic Winchester in Hampshire. But the South Downs is just one of Hampshire’s national parks, the other is the New Forest. Declared a royal hunting ground by William the Conqueror way back in 1079, the New Forest is an area of open access land where even ponies roam free. Nowadays it’s a popular place to walk, cycle, horse ride and spot deer and has plenty of attractions from the grand house and gardens of the Beaulieu Estate to Peppa Pig World! England’s south-west has always been a favourite for campers and it’s easy to see why. Cornwall, Devon, Dorset and Somerset all have amazing coast and countryside which means a pitch with a view isn’t hard to find. The Cornish coast alone is 300 miles long and includes dramatic cliffs, beautiful beaches and laid-back beach retreats. Along with neighbouring Devon, it’s a magnet for surfers and families looking for a holiday by the seaside with long sandy beaches in between its quaint fishing villages. It’s a similar story in Dorset where the UNESCO World Heritage-listed Jurassic Coast is the jewel in the county’s crown. The South West Coast Path tracks a 630-mile route around the whole of the south-west from Minehead in Somerset on the north coast to Poole Harbour in Dorset. Inland, West Country camping is no less special. 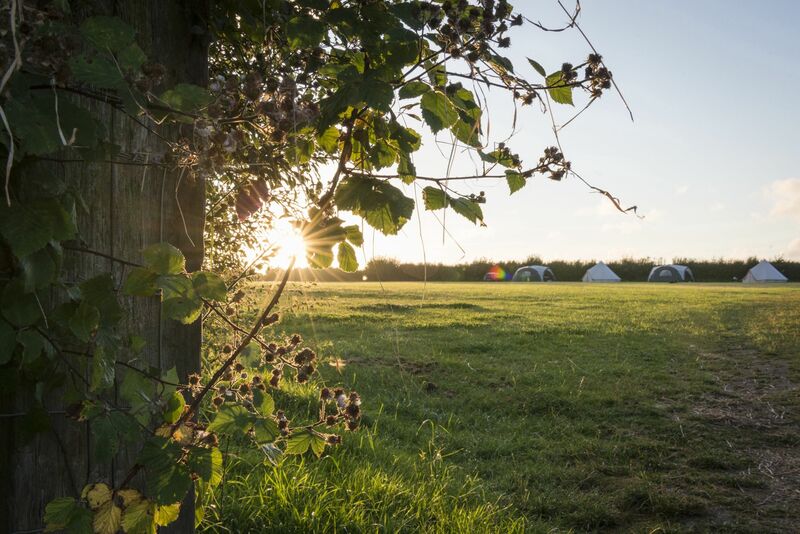 The south west corner is largely rural and there are plenty of farm-based camping and glamping sites among the orchards, meadows and farmers’ fields: many with an emphasis on being eco-friendly. Then there are the West Country’s two national parks: Exmoor and Dartmoor with miles of wild heather moorland, stone circles and free-roaming ponies. When it comes to days out in the West Country in addition to blissed-out days on the beach and rambles in the countryside there are plenty of places to visit: the Eden Project, Land’s End, Cheddar Gorge, Corfe and Tintagel Castles to name just a few. Camping provides the perfect antidote to the stresses and strains of city life. Swap city streets for woodland pathways and traffic noise for birdsong; leave the laptop and the mobile phone in favour of the simple life and you’re sure to feel refreshed. There are some great campsites near London that make even just a weekend away a real possibility for city dwellers. 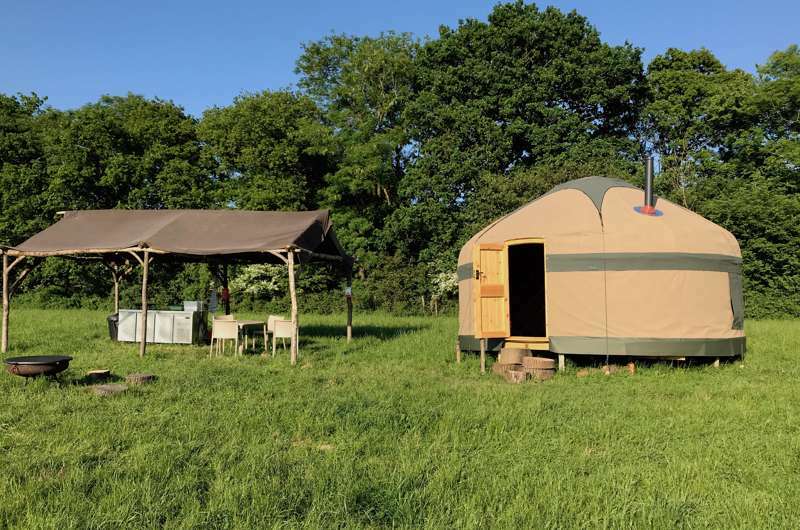 And if your idea of relaxation does not include lugging a tent and pitching it yourself, there are now plenty of glamping sites within easy reach of the capital too so you can still enjoy reconnecting with nature – but without any of the hassle. Within two hours of leaving the city you can be relaxing at a camping or glamping site. The obvious choices for camping near London are the home counties of Hertfordshire, Essex, Kent, Surrey, Berkshire and Buckinghamshire. There are lots of camping and glamping sites in these regions and it’s only a short skip from the M25 to reach East and West Sussex where there’s a great selection of camping and glamping sites. The closest sites to London offer countryside or forest camping or glamping but head south in to Kent or Sussex and you can be by or within reach of the sea too. Choose a campsite with good public transport connections and you can make your Friday-night commute straight to camp. And, of course, it works the other way around too: if you are looking to camp somewhere that’s not too far from the city so you can spend a day seeing the sights, camping and glamping sites close to a railway station are the best idea. If you're from the US, you might find the language differences confusing, but over here in blighty we refer to campgrounds as campsites and luxury camping (tipis etc) as glamping. 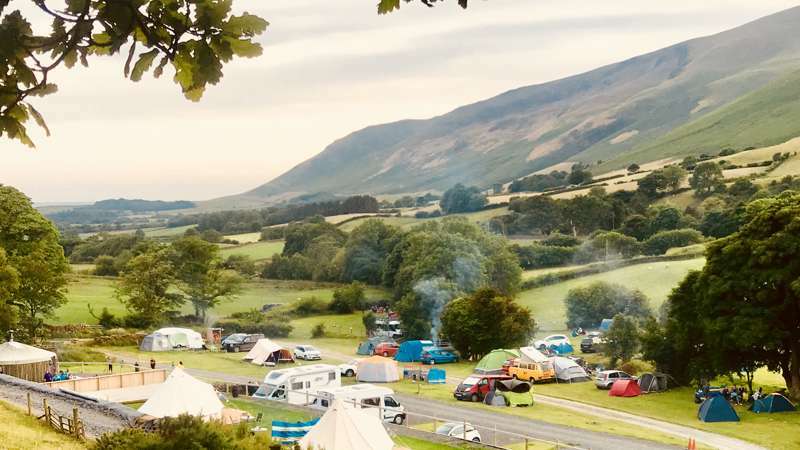 England, Campsites in England, Camping England, Glamping England, Glamping sites in England, Glampsites England, Glampsites in England, Camping in England, at Campsites in England, Discover the best campsites in England, from the coast of Cornwall to the mountains of the Lake District. Adult-only campsites, tent-only pitches, dog-friendly sites, family-friendly spot, we’ve got something for you. Book your camping holiday in England for the best price.